For a quantum system to be captured by a stationary statistical ensemble, as is common in thermodynamics and statistical mechanics, it is necessary that it reaches some apparently stationary state in the first place. 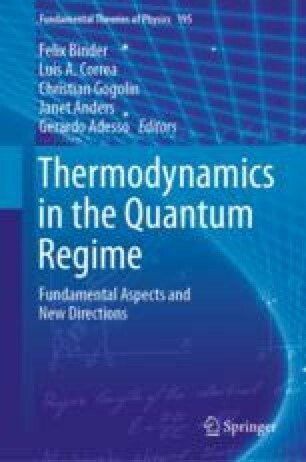 In this book chapter, we discuss the problem of equilibration and specifically provide insights into how long it takes to reach equilibrium in closed quantum systems. We first briefly discuss the connection of this problem with recent experiments and forthcoming quantum simulators. Then we provide a comprehensive discussion of equilibration from a heuristic point of view, with a focus on providing an intuitive understanding and connecting the problem with general properties of interacting many-body systems. Finally, we provide a concise review of the rigorous results on equilibration times that are known in the literature. We would like to thank Lea F. Santos, C. Gogolin, and P. Reimann for comments on an earlier draft. H. W. and J. E. acknowledge funding from the Studienstiftung des Deutschen Volkes, the ERC (TAQ), the DFG (EI 519/14-1, EI 519/7-1, CRC 183), and the Templeton Foundation. T. R. O. is supported by the Brazilian National Institute for Science and Technology of Quantum Information (INCT-IQ) and the National Counsel of Technological and Scientific Development (CNPq).